Since the time I started blogging (February this year), I was sure to have some AHA! moments in the whole of blogging course but never knew this would come in within a year of my spree, all thanks to a very kind community of food bloggers in UAE – Fooderati Arabia. Like most of the people who love food – cooking and experimenting with various cuisines has been my ultimate passion and the most secret desire is to meet the chefs that have inspired me at one point or the other. Well, fingers crossed for that! Today, along with this blog, which started off as an hobby I am gradually inching towards chasing my desires, contribute recipes that I have grown up eating and be absolutely productive in an enormous world that is “FOOD”! When an email landed in my inbox to spend an evening with Chef Sanjeev Kapoor at his restaurant Options in Dubai, I literally screamed with joy and my face didn’t miss a smile. This was one opportunity I didn’t wanted to slip at any cost. The event was more in celebration of Independence Day of India but I decided to attend it only because I wanted to see the Chef in action and had all dreams of bringing a fan girl moment alive miles away from my home country from where it all started! In India, Chef Sanjeev Kapoor is a household name. I have literally grown up watching his first and long-lasting TV show Khana Khazana on Zee TV, back when the cooking shows were not very popular amongst the masses but with his charming personality and the ability to connect with the audiences, his programs picked up the pace with a lightening speed. My sister and I watched with sheer pleasure though I was too young and had hardly attempted my hand to stir a spoon in my mom’s adored pots & pans only because mom was totally glued to the episodes, loved noting down the ingredients and crack the dish in her own kitchen. And also, I secretly adored various legitimate nuances he’d perform while hosting! As a newly wed and a week before when I was about to fly to Dubai from Bombay, I visited Crossword (beloved book store in India) knowing quite well what I had in mind. Like a devoted fan, I faithfully stocked my luggage with his cookbooks ranging from vegetarian main dishes, snacks and starters, drinks and mocktails, soups, salads, sandwiches, Italian and desserts recipes. Apart from the cooking shows he host, being a mastermind behind 24×7 Food and Lifestyle channel on Indian television (FoodFood), various restaurants he opened worldwide and diversified cookbooks that he has authored, he has now carefully developed himself to be a prominent celebrity and a known face of Indian cuisine in most parts of the World through the work he has done in the last couple of decades. After the food was served illustrating traditional Indian dishes like Butter Chicken and Biryani at Options by Sanjeev Kapoor in the midst of exquisitely lit candles, hanging chandeliers and glistening decor, Chef made it a point to meet and greet each guest present at the event. He was as friendly and energetic as I had expected him to be with light air and under no pretense of being a culinary celebrity inspite of contributing tremendous prowess for Indian cuisine to reach at heights in par with other worldly cuisines. As I saw him take a round and approach our table slowly and steadily, my heart kept pounding faster only with the thought that how an introvert like me would break an ice. Delicately observing him take time to chat with every guest and patiently pose for a photograph, first time in my life I was star struck as soulful music kept playing in the background on the piano by an old gentleman whom I had attentively noticed some three years back on the same instrument at the same restaurant with same perseverance. 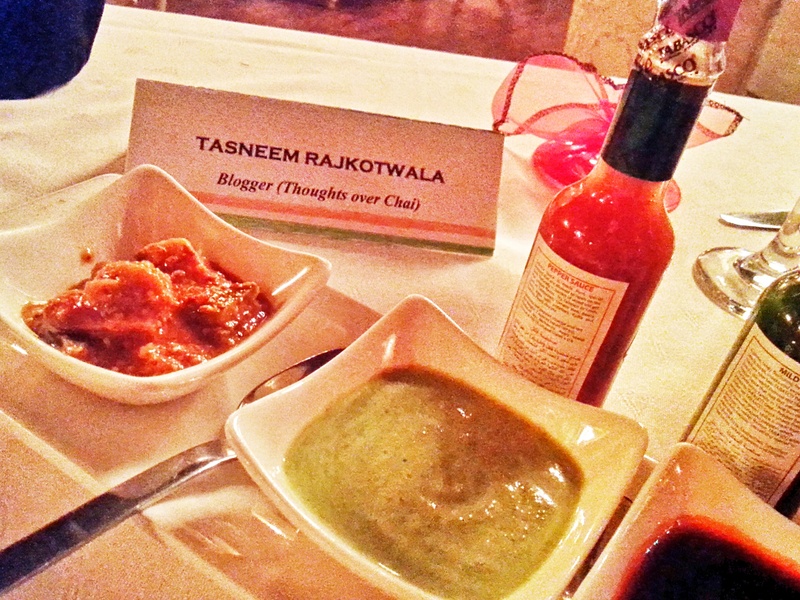 When the Chef was finally at our table, I was completely tongue-tied given his high list of laurels and achievements. Husband spoke few words with him and kept the conversation going till I gained composure while Little A hovered around and I was finally introduced! At that moment I realized he is just the same what we see on TV – cheerful, gracious, extremely polite and very very humble. He compassionately heard me telling him a little about myself, how my mom religiously watched his shows and that I have recently started my own food blog. He respectfully gave regards to mom and told me to go chase my dreams! Considering those were the sweetest words I had heard that evening, my face didn’t lose an inch of a sparkle for the next few days. He is so comfortable to be around and it is this unpretentious attitude, experience and warm approach that makes him so special and attract people wherever he goes. The humility and aura he has around him is astounding. He is not the person to wear his attitude on sleeve but a charming human who’ll laugh with you and make you feel relaxed whatever the situation is. His easy narrative and his own signature style of presentation of the toughest dishes make the recipes look conquerable and gave confidence that even a colt like me can cook when I rigidly started cooking meals not only for myself but for dozen others in my new home. Just shaking a hand and talking with him for a couple of minutes, I walked out of the restaurant feeling adept and polished. This was my first meeting with him and I certainly hope that it’s not the last! Now, I’ll leave you with some shots from an evening which is evidently going to be a remarkable one in the journey that I have embarked upon as a blogger. ← Cardamom Spiced French Toast With Strawberry Cream Cheese Filling.